Fame is the name of the game. THE kids from Fame will take to the stage tonight in one of the most spectacular musical productions ever attempted at King George's Hall in Blackburn. Over 70 young people aged from seven to 20 from around East Lancashire will be involved in Say Two's version of Fame which tells the story of youngsters living out their dreams by attending stage school. Director Christine Appleby said: "This is the same show which is currently playing to packed houses in the West End and it is a hugely challenging musical. "But there is so much talent out there that we have no fears that the cast won't pull it off in style. "It is certainly one of the biggest shows we have done in the area, particularly considering some of the cast are genuinely raw talent and have not performed before." 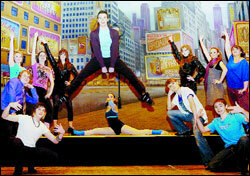 Open auditions were held before Christmas for the one-off show and rehearsals have been held ever since. Say Two's, which has a Saturday morning theatre school based at King George's, has eight shows touring around the country and Christine is hoping that some of the kids from Fame will go on to careers in the theatre. Fame starts at 7.30pm. Call 01254 582582 for tickets.